As the New Year begins, imagine that this is how your 2018 ended. You work at a company where the CEO and the management team are notoriously corrupt. They began the year by taking on a $150 million in new debt for the purpose of rewarding themselves and their shareholders with a massive stock buyback. But as the holidays approached, the big boss declares about a third of all the workers will be furloughed or required to work without pay. Then–just in time for Christmas—the CEO announces the 2 percent raise planned for 2019 will be cancelled. The company, he complains, can’t afford the $25 million-dollar cost. As it turns out, that hypothetical is actually real. Just multiply the dollar figures by 1,000 and replace “CEO” with “President Donald Trump.” The result is the “happy holidays” experienced by the 2.2 million employees of the federal government. Of course, this was no surprise attack on the Americans who do the work of the people’s government. The Republican war on the 22.3 million public sector employees of federal, state and local governments has been underway for years. And the twin goals of that GOP assault—to demonize government itself while fatally wounding the last bastion of American union power–have never changed. The context for the current GOP punishment of public sector workers is Trump’s unnecessary government shutdown. (Unnecessary, that is, because the Senate passed a bill featuring $1.3 billion in border security funding with Trump’s blessing on the Wednesday before Christmas, only to have Trump change his mind within 24 hours. And a year ago, Trump and Democratic Minority Leader Chuck Schumer agreed to a deal funding the President’s border wall in exchange for a resolution of the fate of the 800,000 “Dreamers.” Chief of staff John Kelly then blew up the deal.) Of the nation’s 2.2 million civilian workers (excluding 600,000 in the postal service), some 340,000 federal employees have now been furloughed, while an additional 500,000 are now working without pay. The GOP’s best and brightest greeted those numbers by essentially telling America’s public servants to drop dead. Do the Dems realize that most of the people not getting paid are Democrats? As usual, Trump was wrong. It’s not just that Washington DC, Maryland and Northern Virginia do not account for all federal workers. Hundreds of thousands (roughly 80 percent) are distributed around the country and not just in the biggest states like California, Texas and New York. As a percentage of their state workforces, some of the reddest states have the highest shares of Uncle Sam’s employees. Just as important, many of the metro areas in which federal salaries make up the biggest slices of all civilian employee earnings are in places like New Bern, North Carolina, Warner Robbins, Georgia and Huntsville, Alabama. In a 2016 Government Executive survey, 28 percent of federal employees identified themselves as Democrats, and 26 percent said they were Republicans. But an even greater percentage, 35 percent, identified as independents. And of those in the last category, 42 percent said they leaned Republican, while only 31 percent said they leaned Democratic. But Trump’s message never had anything to do with his fidelity to the truth, but to his hardline supporters. And by marking federal employees as “Democrats,” the President of the United States was signaling the MAGA crowd that public servants, like immigrants, minorities and Muslims, were a target for their scorn. But while 1.3 million military personnel did receive a 2.6 percent pay raise, on December 29 informed civilian workers they would be getting none at all for the third time since 2010. The executive order confirmed Trump’s warnings from February and August 2018 that he would oppose the planned 2.1 percent increase and $25 billion in adjustments for “locality pay.” When the White House is boasting of rising wages and claiming (wrongly) that “we have the best economy we’ve ever had, in the history of our country,” just why would Donald Trump feel this move is necessary? The cost of employing the Federal workforce is significant. In light of our Nation’s fiscal situation, Federal employee pay must be performance-based, and aligned strategically toward recruiting, retaining, and rewarding high-performing Federal employees and those with critical skill sets. Across-the-board pay increases and locality pay increases, in particular, have long-term fixed costs, yet fail to address existing pay disparities or target mission critical recruitment and retention goals. Disdain, indeed. After all, the Congressional Budget Office (CBO) reported that in fiscal year 2016 federal spending on total civilian employee compensation was $215 billion. Even if that figure was now, say, $250 billion, a two percent increase would only add $5 billion to Uncle Sam’s $4.4 trillion budget. Adding in the estimated $25 billion for regional “locality” adjustments for higher cost of living areas around the country and the total tab is additional spending is around $30 billion. And that’s a drop in the bucket compared to the GOP’s Tax Cuts and Job Act which starting in 2018 will drain an estimated $1.5 trillion from the United States Treasury over the next decade. And that tax cut windfall for the wealthy will deliver the vast majority of its benefits to the most affluent people in the United States. The council, consisting of unions representing federal employees and nongovernmental pay experts, oversees the pay system for most white-collar employees below the executive level, the General Schedule. Under a 1990 law, its findings are passed to a higher-level body of administration officials, who in turn make recommendations to the White House for specific raises for 44 city zones and a single figure for all areas outside those zones. Now, these conclusions are hotly contested. In its 2017 analysis, the Post noted, “t Congressional Budget Office concluded that federal employees overall earn 3 percent more on average but that there are large differences by educational level: from a 34 percent advantage for federal workers with a high school education or less to a 24 percent shortfall for those with a professional degree or doctorate.” (These comparisons include total compensation combining both salary and benefits.) Unsurprisingly, conservative groups find the reverse of the Federal Salary Council, and then claim government workers far out-earn their private sector counterparts. And that’s no surprise because Republicans have been trying to crush federal employees and their unions for years. The rise of government unions has been like a silent coup, an inside job engineered by self-interested politicians and fueled by campaign contributions. Align Federal Employee Compensation With The Private Sector — Savings: $47 Billion. Federal compensation exceeds private sector levels by as much as 30 to 40 percent when benefits are taken into account. This must be corrected. Of course, it wasn’t true then and it’s not true now. But what is true is that the federal civilian employees have received pay hikes less than or equal to American military personnel every year this century. Thanks to Congressional Republicans, General Schedule workers got no raises for 2011, 2012 and 2013. 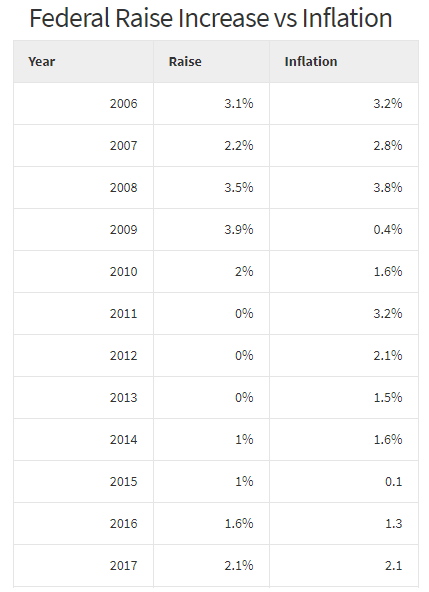 Since 2010, federal pay increases exceeded the inflation rate in only three years. 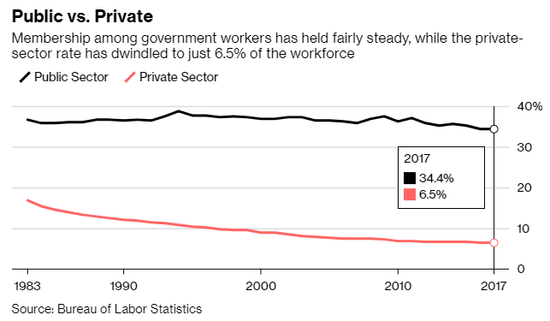 But what is true is that while private sector union membership and political power has plummeted, public sector unions like AFSCME, SEIU, NEA and others combined still represent 34.4 percent of government workers. It is their remaining political power, usually deployed on behalf of Democratic candidates and progressive causes, that Republicans like Donald Trump, Scott Walker and John Kasich have sought to crush. 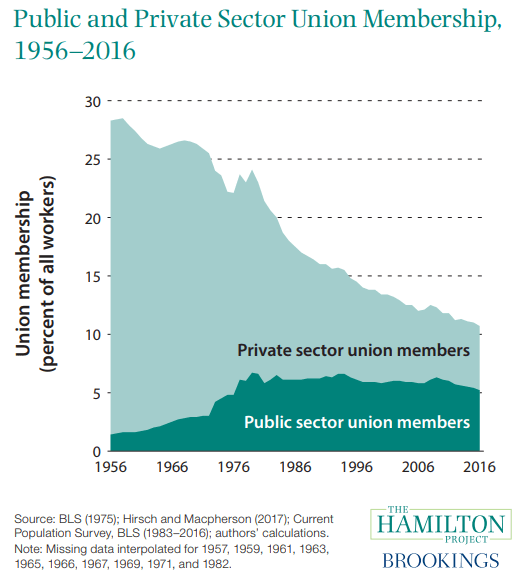 In executive orders, legislatures, state ballot measures and in state and federal courthouses, the GOP has worked without let up to limit the ability of public sector unions to retain members and collect dues. The goal is to leave the last redoubt of union power broken and broke, no match for the unlimited resources for corporate power. It’s actually much worse than that. Trump and his Republican allies want it to be another nail in the coffin for unions. This article previously appeared at Daily Kos.